*a comprehensive analysis of intercultural information on how teacher preparation institutions address intercultural education at the present time. An overall concern of each chapter author is how intercultural approaches can be employed to solve the difficulties faced by both individuals and schools while maintaining the cultural integrity of the child. "Kenneth Cushner's book is courageous and innovative. It examines 13 national education responses to the challenges of dealing with cultural diversity….So it is courageous to draw comparisons across diverse contexts and diverse ways of seeing, and thus tackling, the challenges of intercultural education….Cushner concludes that there are common issues emerging from the 13 brief and probably contestable overviews….Successful resolution may include diverse teacher recruitment and appropriate preparation as well as national commitments to prioritize intercultural issues. This inovative and challenging book builds a basis for developing such a commitment." "This book is a welcome addition to the growing literature on multicultural/intercultural education…. I found the volume a rich source of information and very inspiring. Indeed, in my opinion, it should find its place on the book shelves of adminstractors, teachers, and educationalists who are seriously concerned with the education of all children and young people in the coming millennium." "His latest volume, International Perspectives on Intercultural Education, has accomplished a formidable task. In one text, he has successfully compiled studies of thirteen country's status with regard to intercultural education. The authors are scholars and researchers with considerable expertise in their respective countries. As such, each section of the text is authoritative and thorough." "…in the vanguard of a world-wide movement to understand and deal with issues of multicultural education, intercultural education, and diversity as educators and educational policymakers attempt to deal with increasing social divisions….Many of these dilemmas condense around education and schooling in particular because education is seen by states everywhere as part of the solution to national survival and economic competitiveness. This book fits a need to have wider coverage of the issues and particular regional studies." "Although there is a substantial and growing body of literature dealing with intercultural and multicultural issues in education, there are far fewer works that seek to address the field in a truly international/global manner. This book provides a very good start toward filling that gap." "…places multicultural education in a global perspective….Makes a significant contribution to the fields of multicultural education and teacher education." Contents: Preface. 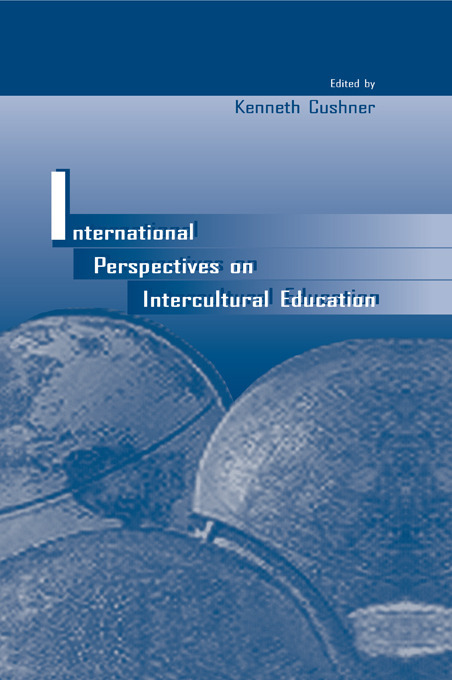 K. Cushner, Intercultural Education From an International Perspective: An Introduction. B. Hill, R. Allan, Intercultural Education in Australia. R. Bishop, T. Glynn, Achieving Cultural Integrity in Education in Aotearoa/New Zealand. H. Gaudart, Interculturalism in Education: A Malaysian Perspective. H. Hooghoof, R. Delnoy, Intercultural Education: Approaches in the Netherlands. P. Figueroa, Intercultural Education in Britain. A.S. Ciges, R.G. Lopez, The Challenge of Intercultural Education in Spain. V. Neumann, Intercultural Pedagogy as an Alternative to the Monoculturally Oriented Education: The Case of Romania. S.O. Michael, Y.A. Michael, Multiculturalism in the Context of Africa: The Case of Nigeria. J. Stonier, Breaking Out of a Separatist Paradigm: Intercultural Education in South Africa. B.A. Eshun, Ghana: Education in a Multicultural Context. V. Seeberg, B. Swadener, M. Vanden-Wyngaard, T. Rickel, Multicultural Education in the United States. R. Fowler, Intercultural Education in Canada: Glimpses From the Past, Hopes for the Future. A.E. Huerta, N. Tarrow, G.S. Sanchez, Intercultural Education: The Case of Mexico. K. Cushner, Intercultural Education From an International Perspective: Commonalities and Future Prospects.